Following the wave of protests in late February-March 2017, the EaP CSF Monitoring Mission visited Belarus during the period of 28 March-1 April 2017 and developed a set of recommendations towards the EU, Belarusian authorities and civil society. Even in the absence of an election process this year, the demonstrations attracted an unexpectedly high level of participation, while an unrest of a comparable scale has not occurred since the 2010 presidential vote. The protests were initially triggered by the adoption of Decree No. 3 “On preventing freeloading practices”, imposing a tax on unemployed people. The decree has been declared unconstitutional and inconsistent with the ILO Abolition of Forced Labour Convention, of which Belarus is a signatory. 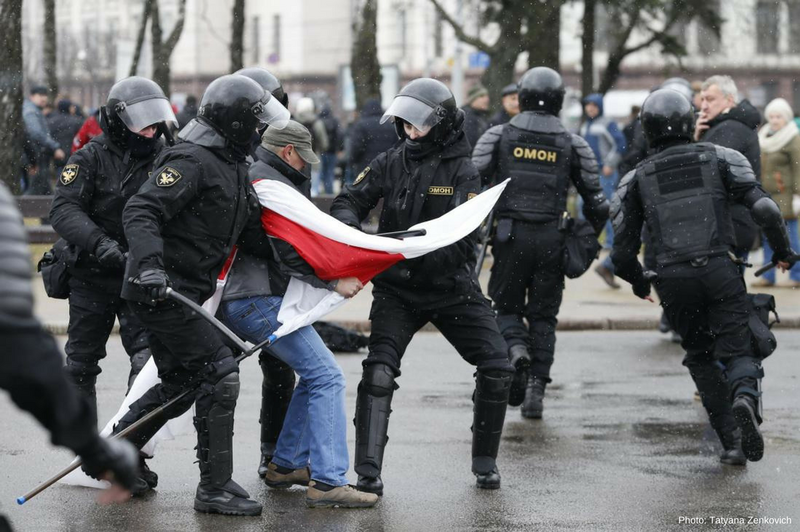 The major demand of the protest was the repeal of this regulation, however it quickly grew in scope and participation, expanding throughout the whole country and leading to the detention of around 900 people by Belarusian authorities. The adoption of the Decree, however, occurred against the backdrop of the recent rapprochement with the EU. In 2015 the EU-Belarus Human Rights Dialogue was resumed and in the same year six remaining political prisoners were released. Despite this progress, the overall process of liberalisation in Belarus failed to ensure systemic changes in legislation that would make the implementation of reforms binding for the authorities. Commenting on this issue, the Key Expert of the Mission Mikayel Hovhannisyan, pointed out: “Belarus is in dire need for real liberalisation since the whole process after August 2015 was an imitation of reforms rather than a systemic effort. The government must realise that in order to avoid even deeper political, social and economic crises in the near future the civil society, political parties and enterprises should be able to operate in a free environment”. In the context of the recent protests, not only were many demonstrators arbitrarily detained, but also detentions, trials and other legal procedures involved various human rights abuses. The actions of the authorities had a clear political motivation, undermining fundamental human rights to freedom of speech, freedom of opinion and expression, and freedom of peaceful assembly. The EaP CSF Mission developed a set of recommendations to the major stakeholders of the EU-Belarus dialogue. More specifically, the recommendations to the EU institutions and member states highlight the importance of a partnership strategy based on a conditionality approach, where political and economic reforms are interdependent and civil society is engaged as an institutional partner. Moreover, the EU should systematically raise the fundamental freedoms during the meetings of the EU-Belarus Coordination Group and ensure that they are at the core of the future Partnership Priorities. In the same vein, the Mission appealed to the Belarusian government authorities, demanding the release of all detained activists and the repeal of Decree No. 3. This is of the utmost importance, as the Head of Mission Maria Golubeva stressed: “The Belarusian civil society still lives under the threat of persecution, since the authorities have preserved all repressive legal norms that can be applied at their discretion. In order to create an enabling environment and to respect human rights and civil liberties, stifling legal norms have to be abolished. Genuine dialogue in all policy areas should be possible between the civil society and the government”. Finally, in order to ensure that the human rights in Belarus and other EaP countries are not neglected within the EU agenda, the EaP CSF commits to provide continued support to the Belarusian civil society, strengthen capacity building among its members, as well as adopt mechanism of monitoring missions as a regular working tool.